20 years ago two race drivers died at a F1 race weekend. One we all have heard of, the other probably not. One was Senna, the one that I’m not going to talk about in this post. It’s the unsung death that I’m going to highlight. That of Ronald Ratsenberger who died on Saturday’s qualifying. Everybody remembers the crash that killed Senna but, on the other hand, I can’t recall the death of Ratsenberger. I have more vivid memories of the third crash that weekend, a young driver at the Jordan team, Rubens Barrichello, suffered an enormous crash in Friday’s qualifying. It was a nice weekend, the sun was out. A great spring day to go motor racing. Nobody would have guessed what was going to happen. It may have been down to the relaxed culture of full safety the sport still had at the time. That tragically changed at that race. I knew that the Austrian, Ratensberger, died that day whist driving for the Simtek team. Apart from that, not much more. This is where this post differs from most of the rest of them. I am doing quite a bit of research about the subject as I don’t know much about the driver. He was in his first season in Formula 1, his third race. When the crash happened, he was on a “flying lap”, trying to qualify for the race on the Sunday. 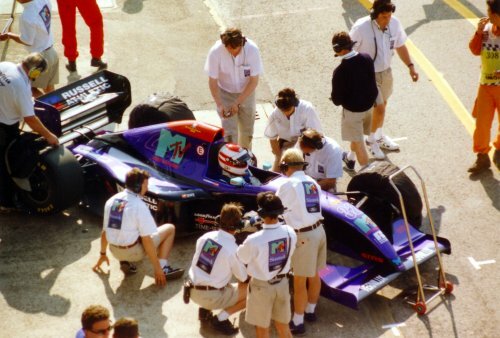 The front wing of his Simtek broke on the entry to Villeneuve corner at about 190 mph. This caused his car to drive over it and be launched into the wall on the outside of the corner. This then caused a basal skull fracture that was his cause of death. A death that wouldn’t, and hopefully couldn’t, occur in today’s F1 due to the mandatory use of the HANS device that protects the driver from that sort of crash. Max Mosley went to his funeral and 10 years later he explained why he went to that one and not Senna’s. Roland had been forgotten. So I went to his funeral because everyone went to Senna’s. I thought it was important that somebody went to his.